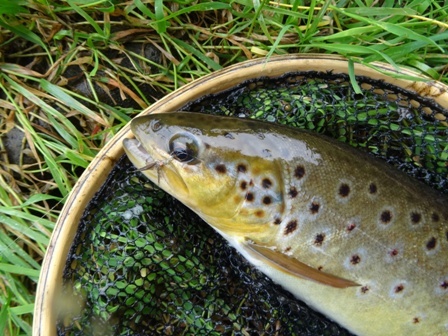 Alas September beckons the end of the trout season but it usually goes out with a bang rather than a whimper. 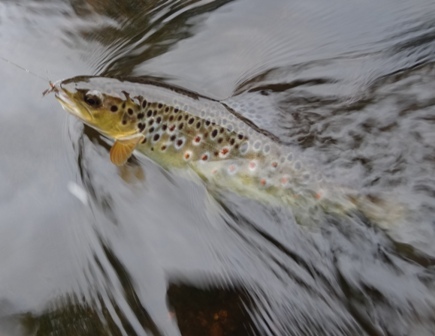 One reason is the hatch of pale wateries which can be spectacular leading to good dry fly sport. 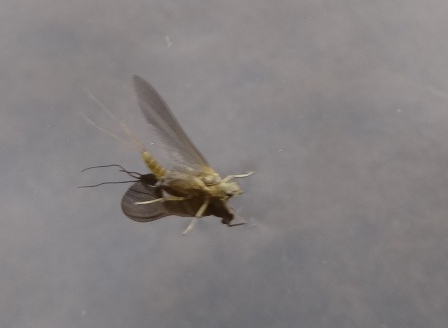 I use the term pale watery as a generic term to cover all pale bodied small species of Mayfly like the ones I pictured below and not specifically Baetis fuscatus. So on this particular September day I arrived at the stream and it was cool (around 10 Celsius) with drizzle in the air. Perfect for pale wateries and so it proved to be. My weapon of choice was the soft hackle dry fly although this has barely been off the end of my tippet this season. It is tied on a size 14 Maruto DO4 bl (these superb barbless hooks now available on the website) and is somewhat larger than the natural pale wateries which range from about a size 16 right down to size 20. The thing is the trout don’t seem to care and if anything select for the artificial fly even when plenty of natural flies are available. I tie the soft hackle dry fly using UV hares ear plus dubbing in 08 golden and 09 tan. By blending these two dubbings I can achieve a very precise match to the natural. On arriving at the first pool I count ten fish rising steadily to a torrent of natural flies. Starting in the tail and fishing upstream the first cast results in a hook up of a pretty wild fish of about 10 inches. I already know this is going to be one of those rare days when fly fishing for trout is as simple as shelling peas. 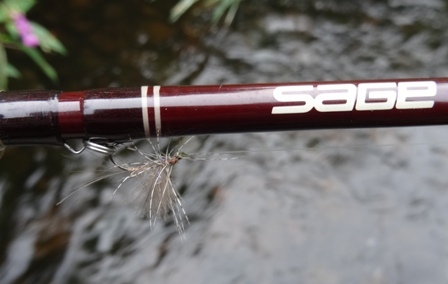 To qualify that remark of course I will fish upstream, move with heron like stealth, cast accurately and without disturbance and get near perfect dry fly presentation using the furled leader, but to a Guide like myself this is second nature. Not a single fish refused the fly. Half way up the pool one of the rise forms is disturbing considerably more water than the rest. Although I am in a wild stretch of stream far from any access points I know this fish is a stockie. As I bring up this point, now is a good time to establish some facts regarding stocked fish. 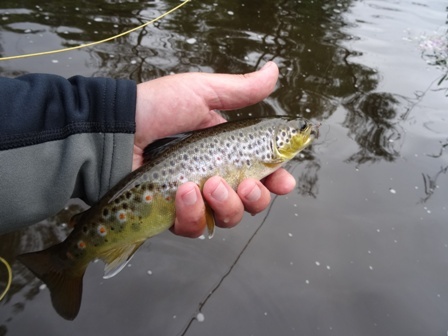 On our You Tube video “Soft hackle dry fly versus selective trout” one viewer has commented “It’s the Derwent- It’s a stockie”. The inference from this remark is that stocked fish are easy peasy to catch as opposed to the wily cunning wild fish. Of course this can be the case, for example when stocked fish are first introduced into the river they are eager and stupid and the majority leave the water fairly quickly and permanently to be barbecued. They take zero skill to catch at this stage and will pretty much try to eat anything you can put in front of them. I found a sea fishing muppet in a tree above a well known stocked pool which illustrates the point. If this “angler” had managed to get the muppet into the water in front of the fresh stocked fish he would have been rewarded. But the remaining stockies that become naturalised they are a different matter entirely. They become increasingly difficult to catch the longer they remain in the river. In fact they are far more difficult to catch than the wild trout. I had a conversation with Simon Robinson a few years back about precisely this point. The stockie in the video is full finned and its tail re-grown. It’s in an area miles from any stocking point and feeds naturally on surface insects. It is exactly the selective trout the video title refers to. I catch several wild trout in the video as well but these are all too eager and far from selective. That said I much prefer wild trout (like the pretty fish below) to any type of stocked fish. First cast over the stocked fish and the artificial is not taken. It isn’t quite on the right line. I have used this term a great deal and it often causes confusion. Often lines in rivers are clearly demarked by foam lines or current creases. Fish don’t think- “Ah a foam line I will live along it”. No they are there because such creases and lines are the natural funnels concentrating food into a small area. This is significant because if fish feed along such lines they will not move even 2-3 inches to one side of it. Effectively the fish behaves like a train on a track, conditioned by the hydrology to remain fixed on one point because that is where the food is! I’m about 4 inches off the line but that is enough. The next cast is on the money and through my polarized glasses I see the large flank of a substantial fish move as if in slow motion and casually intercept the soft hackle dry. Unlike the previous wild trout this fish does not leave the water in a display of aerial acrobatics but surges off. The 389 LL does its job absorbing the shock and only 15 seconds later it is in the net. It is the first of six stocked fish for the session. I finish the first small pool with a hit rate of 80%. 8 out of ten fish brought to hand or net. 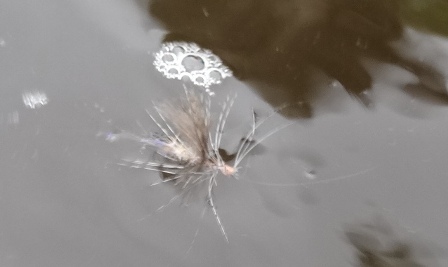 One I lost a few seconds after hooking and one I spooked by missing it as it took the fly. I have 6 more similar pools to fish on the way back to the car and achieve a similar result in each pool. After 3 and a half hours fishing I finish with 42 trout, 36 which are wild and six stockies which are distributed fairly evenly demonstrating they are naturalised. All readily accept the soft hackle dry fly during a decent hatch of flies. This is as good as dry fly fishing gets. I hope you all get to experience some similar end of season action.